Lord, I am here to remember your completed sacrifice against my sin, and to remember your grace against my corruption, and your love against my fears. I believe your word; I remember your command; I adore your goodness; I wait for your redemption. Thank you for effecting your completed sacrifice on the cross and making it the seal of mercy, and the conveyance of life to me. O Lord Jesus, come into my heart. I look to You for mercy and strength to keep mercy. I profess my faith in Christ, that I have pardon and peace with God, life and righteousness only by his death and merits; and to own my obligation to live unto him that died for me, in faith, love, and self-dedication. I look for Christ’s love and likeness; for the benefit and for the efficacy of the cross; to have the load of sin taken from my heart; and any other load, which Christ thinks fit, laid upon my back. I look to You to help me leave sin behind me, and to receive Christ instead of it; and if I do the one, having laid my sins on Christ, with a will to forsake them, I am sure of the other. Lord, grant me the peace, and all that comes with it, as well as love, patience, resignation, thankfulness, deliverance from the fear of death, and a hearty longing for eternity, I look to the cross for the pardon of sin, for the kindling of love, for the turning of my heart, for the renewal of my will. I look to You, not to give, but to receive; not to tell you how good I am, but to think how good you are. 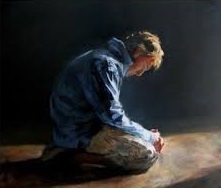 I have a great many sins and wants to tell you Lord, more than would take up the whole day; and when I have told you all that I know of in myself, it is not the half, but a very little of what you know about me. I bring myself and my sin to you, believing that you will be all to me, and do all for me that is in your heart. I go as a Sinner to a Saviour. To whom else should I go, with my blind eyes, foul leprosy, hard heart, and rebellious will? You tell me what I must have, I know not how many graces I need; but I cannot stay for them; my wants are urgent; I am a dying man. My Lord, with your own kindness, you say, “come; do this; remember me.” Your invitation is qualification enough for me to participate today; and I long to feed on you, to thank you, to take you into my heart. I will behold you crucified, and your blood poured out for me, in spite of all my sins and fears; and though all the saints on earth stood up with one mouth to forbid me, I go to put myself under your wings, and to fly to you for refuge from the monster sin, ready to devour me. I look to the Cross to know You and myself; to wonder at the reconciliation of strict punishment with free pardon; to see the greatness of my sin, and the greatness of my hope, in the greatness of the sacrifice therein represented; to sin no more, because I believe there is no condemnation for my sin; to be raised as high as heaven, and humbled in the dust; to be astonished at the mystery of Christ crucified, and to profess that I know less of God than ever. Let me be daily thinking of the cross, daily in a state of thankfulness for it, daily living under it, resolving to receiving you in faith and humility, daily learning of your sacrifice of love and undeserved mercy, making your love and life my pattern, and dreading the sin which could be expiated with no less a sacrifice. “Do this in remembrance of me;” –I remember who I am, and what thou are; I will remember you as my Saviour; I will remember you as my Master; I will remember your love; I will remember you as hating my sin; I will remember you as bearing my sin; I will remember you and fear not; help me to remember you and sin not; help me to remember you, to live for you, by you, and through you. I do from a detestation of my sinfulness, and a hearty sense of my want of pardoning grace, accept once again, your covenant of rest and peace: Trusting in you for the accomplishment of my whole salvation, in the way of gospel holiness, by your Spirit; and resolving without delay to put myself into your hands for that purpose. May you keep me steadfast in this faith and engagement, and carry me on from strength to strength that I may be one with you, my Saviour, and I live for you, and I love you with all my heart, and with all my soul.